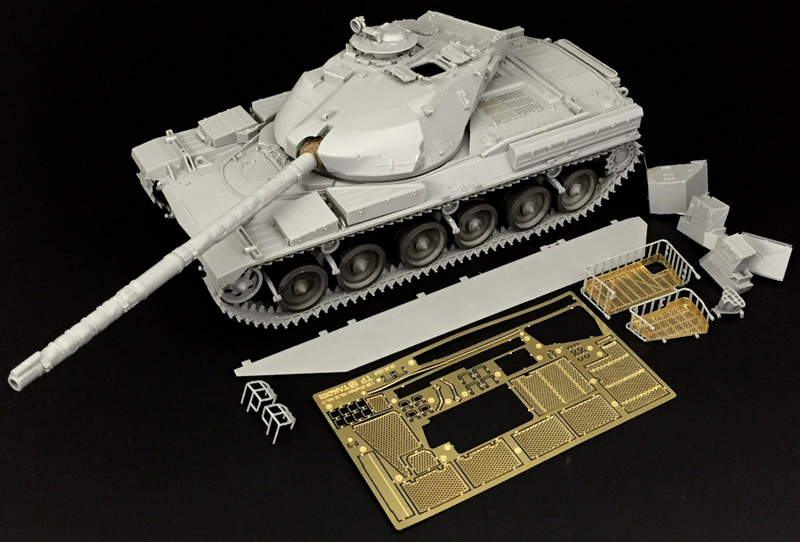 Clayton got straight into the build of Takom's new Mk.I0 Chieftain as soon as he finished his build review here on TMN – Today in Pt.III we see his skills all come together with some nice painting and weathering of the “Berlin Brigade” chieftain Mk.10..
One of the big attractions of this kit for me was the immediate impact the stunning box art has, showing the unique urban camouflage scheme of the Berlin Brigade. From speaking with other armour modellers, I have no doubt in my mind that this scheme will be the source of much inspiration and potentially much frustration for many. So, how hard can it be to mask a few straight lines, blow some paint and repeat? Well I guess that is something many will find out over the coming months. In theory it seems pretty straight forward, right? 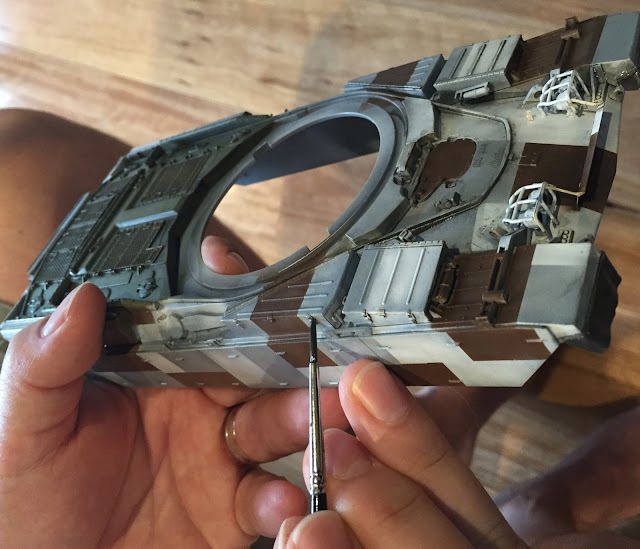 In reality, to hold uniform, straight lines over a three-dimensional model with some seriously deep recesses and fine detail is anything but simple, but some careful planning and preparation can certainly make your life a little easier. 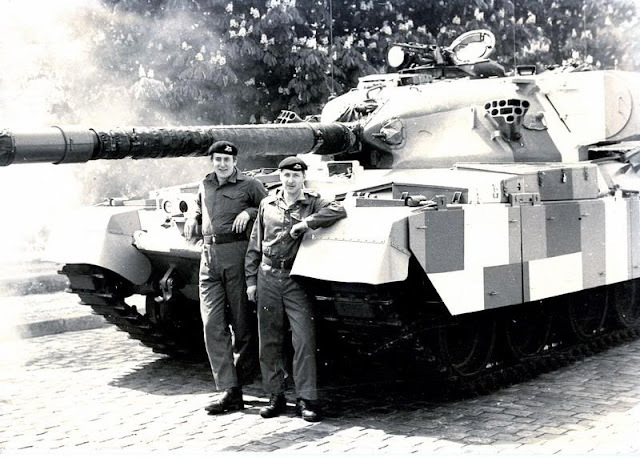 It became very clear early on in the process, that in order to get these straight lines straight, clean and even, it was going to be easier to paint the basis of the scheme with the majority of the detail of the tank not attached. The decision was made to leave off all baskets, smoke grenade launchers, headlights, PE parts and some of the toolboxes. The model would also be painted in two parts, the top and the bottom and joined at a later date. With the shapes and the colours in the scheme, I was a little concerned that paint finish may look a little toy like. In order to help combat that, after an all over primer coat of Alclad White Micro filler, I did a quick and simple pre-shade using Matte Black from the Ammo range of paints. With the pre-shade down, I now softened the effect by spraying A.MIG047, matte white over the areas that would eventually end up remaining white. I didn’t go all over the model because I wanted to make sure the other colours that would be going down would still benefit from the pre-shade effect. 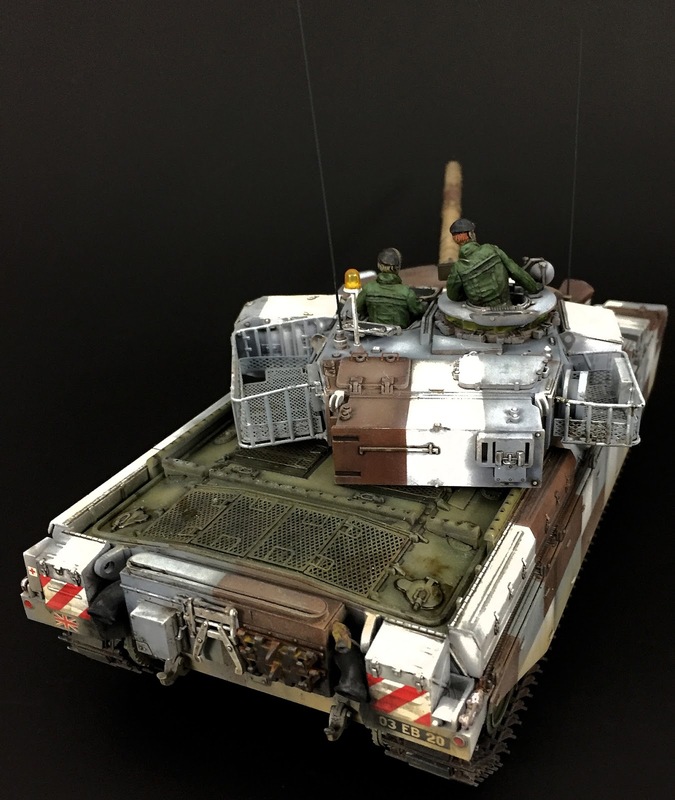 The rear deck of the tank was now masked off with some Tamiya tape and sprayed with NATO Green (A.MIG084). Tonal variation was achieved by mixing the base colour with white, yellow and even Khaki. It is here my background in graphics came in handy. I scanned the colour plates supplied in the kits and created myself a mask set. The machinery used in my business allowed me to create, print and cut the mask sets. I will possibly be selling these through my website if anyone would like a set to help make this process easier - www.theworkbench.com.au. Whilst the mask set won’t do the work for you, it will definitely help lay the foundations of the scheme. With the first part of the mask set down and applied to the model, Grey Blue from the Ammo range of paint was now sprayed in the appropriate places. Care must be taken when laying the mask that it lays nicely through any angles on the model. It may be necessary to reinforce the mask with some small pieces of Blutac or masking tape. The second part of the mask set is now stuck in place and a coat of AMMO’s NATO Brown (A.MIG 085) is applied. Tonal variation is achieved by lightening this colour with Khaki and thinning the mix considerably with Mr. Color Leveling thinner. Masks removed and the effect is instantly obvious. There will be some touching up required in places, but overall it is looking pretty good. 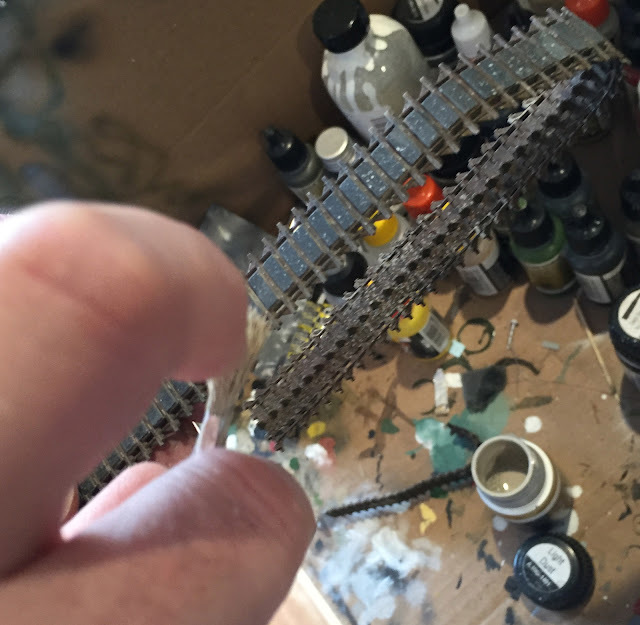 Whilst I haven’t photographed it, I had been pre-painting the ‘bits’ whilst laying down the scheme on the bulk of the tank. These parts are now attached to the model, adding that extra element of life to the model. The tracks were then sprayed in a dark brown colour and the rubber pads were picked out by brush using Vallejo Black Grey. The underside of the model is sprayed in NATO Green. 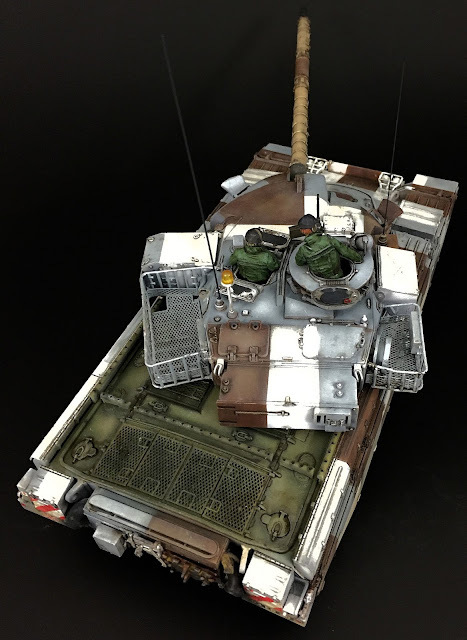 Various dusty tones were loosely sprayed around the structure and then a NATO Camouflage enamel wash was laid down. In reality, much of this underside won’t ever see the light of day, so the care take here was pretty minimal. 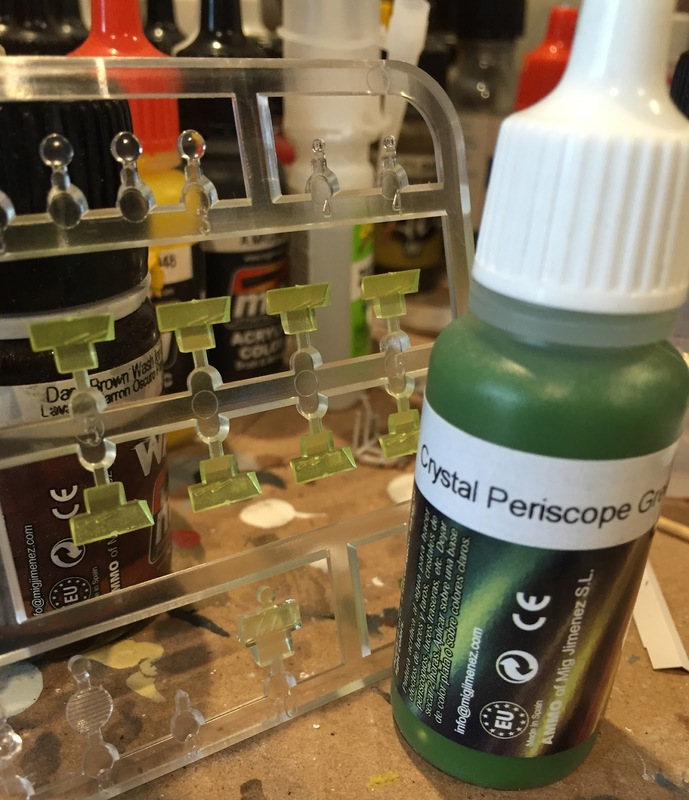 The periscopes on the clear sprue now receive a treatment of Crystal Periscope Green. With a piece of lead foil on hand, I now went about adding the rubber mud flaps on the front of the tank. The foil was applied using CA Glue. The natural flow of the foil gave the effect of the rubber sheeting. 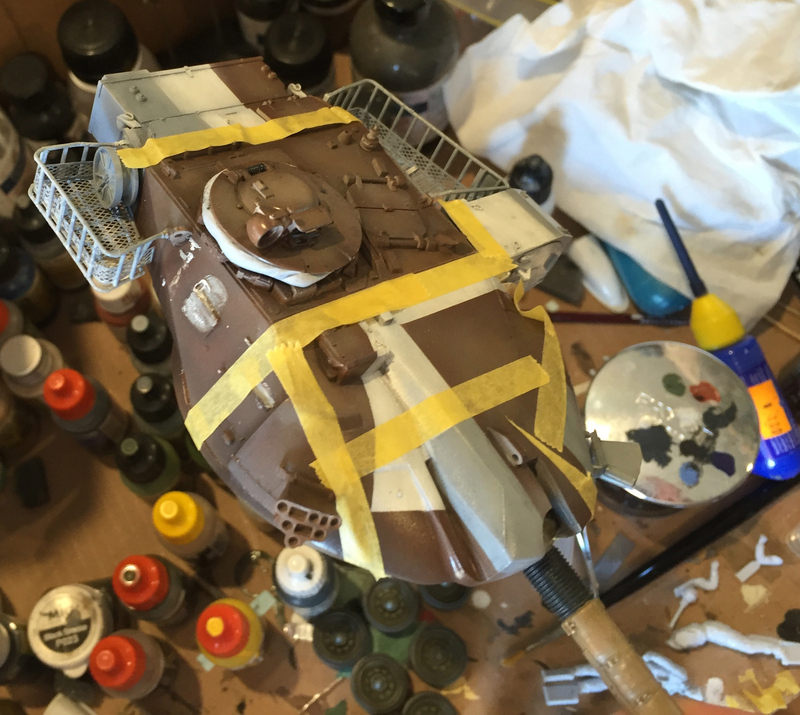 To achieve some tonal variation in the colouring on the tank, small dots of oil paint are now randomly applied over the sides. A combination of blue, white, Shadow Brown and grey were used. The paint is now dragged in a downward motion using a flat brush lightly dampened in white spirit. Be careful not to remove the whole amount of the paint. When complete this technique will give the flat colours some tonal variation and help make the model appear to be more realistic. 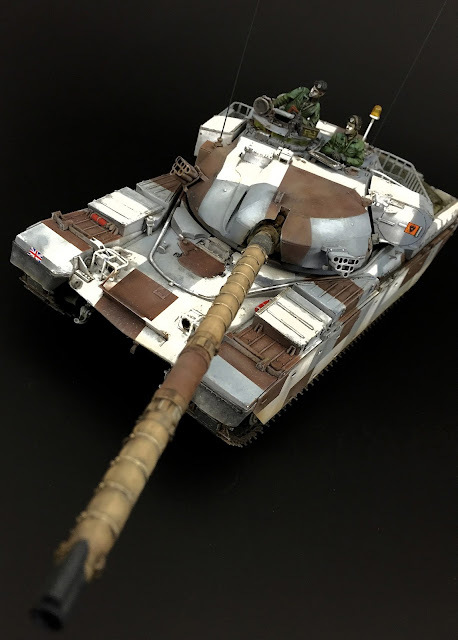 It was about here, when researching some of the finer points of the tank, I realized that the colour plate provided with the kit had some pretty nasty errors in it. The side, front and rear profiles looked good to my eye, but the view from the top has a number of pretty obvious errors. I should have tweaked that there was an error with it because the top shot and the front shot on the colour plate contradict each other. I snapped off a couple of tool boxes and finer parts, and set about re-masking the sections on the turret to be more in line with the actual scheme. Fixing the error was more of an inconvenience than anything, so beware if you chose this scheme. I am sure the error will become common knowledge and most won’t fall into the same trap as I did. The model then received an all over varnish using Alclad Gloss. A line wash was now added using a thinned ‘Starship Filth’ from the Abteilung range of oils. I chose this colour because I felt the dirty grey would unite the colour scheme better than some of the other traditional wash colours. In an attempt to give the newly sprayed blue/grey some interest, a thinned mix of White and Light Grey were used sparingly on some of the panels. Jet Exhaust from the new range of Extreme Metal paints was now used to add some darker spots around the model. You can see here I have added some streaking and shadow around the panel lines on the side skirts. I like this product because of the thin and transparent nature of the paint. A light touch can produce an interesting result. 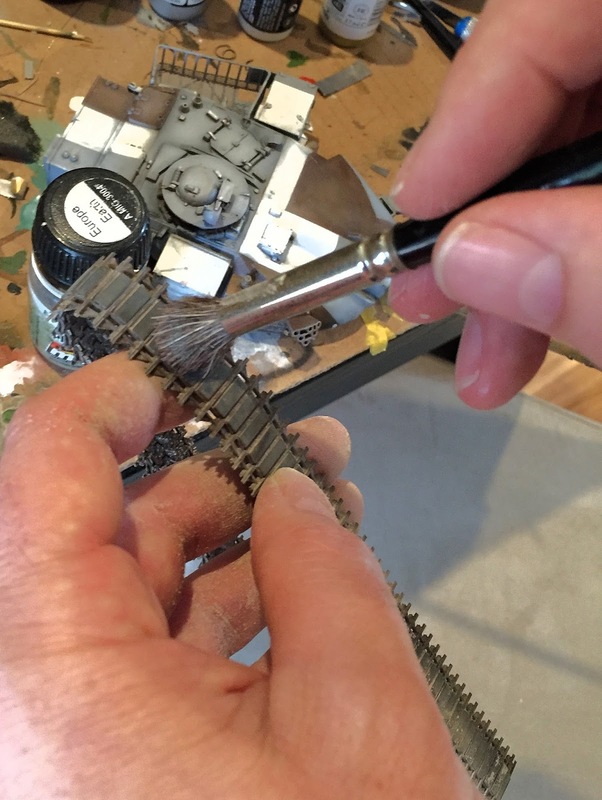 The tracks were now given and dusting with ‘Europe Earth’ pigment from the Ammo range. Given the urban nature of this tank I was conscious not to make it overly muddy. 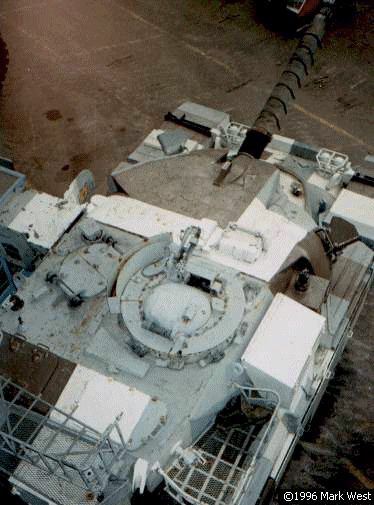 A thinned ‘Light Dust’ enamel paint was now flicked over the tracks and the lower parts of the tank in order to simulate light mud splashes. With the barrel and the thermal sleeve painted, an enamel wash was applied to help raise the highlights in the moulding. The straps and detail were picked out with a fine brush and painted using acrylic paint. Another coat of varnish saw the decals closely follow. Once dry, the machine gun was fitted, the clear parts for the lights and a few details here and there were cleaned up. Stretched sprue was added for the aerials. 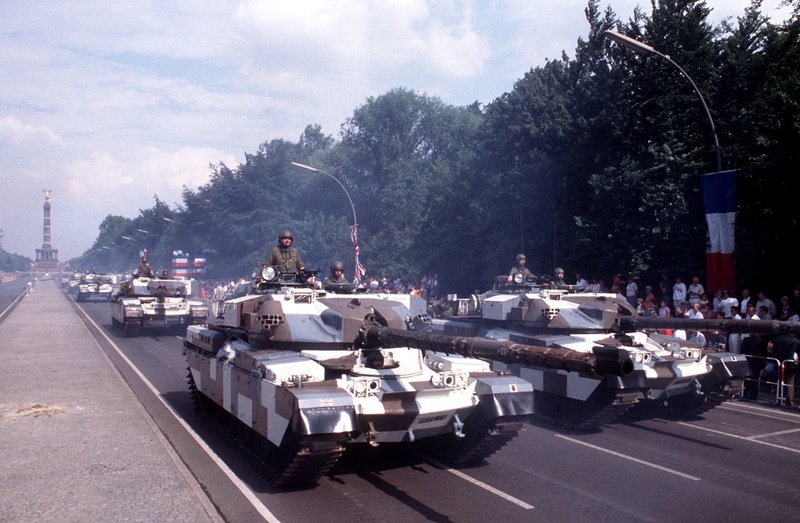 I have read that the aerials were actually painted in the camouflage colours of the tank, but I couldn’t find any photographs to support that, so I chickened out and just painted them Black Grey. The model then received a few hits of Alclad Flat to dull everything down. 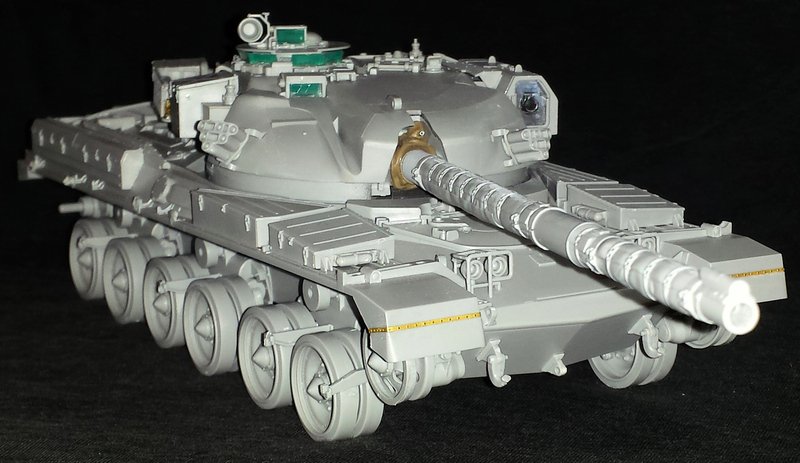 Finding figures for the tank proved to be a little challenging, but I ended up using a set from Valkyrie Miniatures. They were actually West German, but don’t tell anyone! My figure painting skills probably need some refinement, but they really do help bring the model to life. 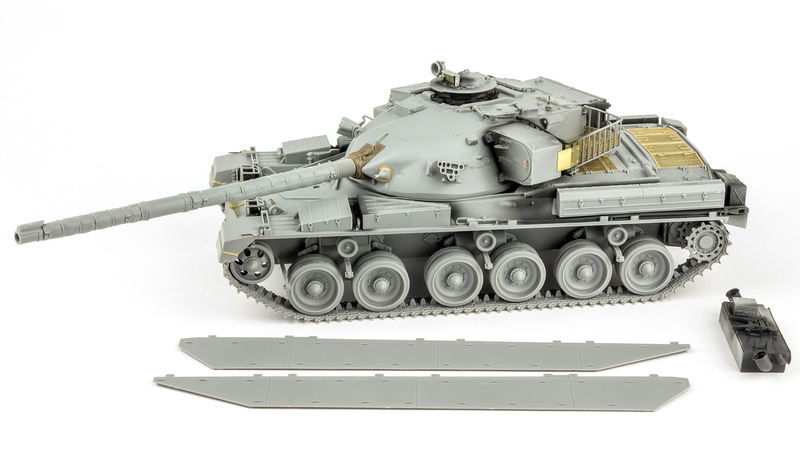 I chose not to add any stowage as I figured it would only be a matter of time before the aftermarket guys started producing sets to compliment these tanks. The resin sets are so amazing these days and would compliment the model far better than some putty bed rolls would. So here it is, the finished Mk10 Chieftain in the unique scheme of the Berlin Brigade. 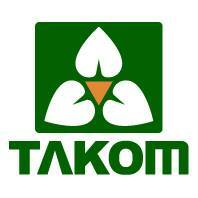 There can be no question that this Takom release is a real beauty. I loved building it and I loved watching the scheme materialize. I am sure this Berlin Brigade scheme will be very popular with this model. Just be careful and do your research before taking it on. This model is highly recommended and is yet another winner from the Takom factory. As mentioned earlier, I am considering producing a masking set for this scheme, so if the level of interest is warranted then it will be all systems go to do some for like minded modellers who want an easy solution. Feel free to contact me through my website www.theworkbench.com.au for details. 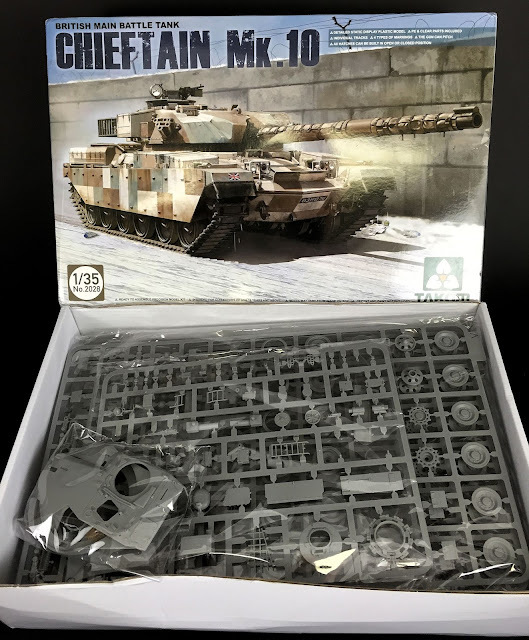 Thanks to Takom for sending this out to be reviewed and built up. See more of Clayton’s builds on his website www.theworkbench.com.au and his Facebook page.